With my recent bout of ill health continuing for much of the week, I was unable to partake in as many events or food trips. Compiling a Top 5 was unrealistic but I’ve managed to up my game from last week – when I was so ill I could only list one measly item! It is with great pleasure that I write: behold this week’s Top 3 Things of the Week! The 1920s themed Speakeasy proved to be one of the most entertaining nights in London! With waitresses clad in basques, exquisite martinis and an awesome burlesque murder-mystery, called The Silencing of Miss Scarlett it was a fun-filled night of glamour and naughtiness. Read my full review for The Upcoming here. 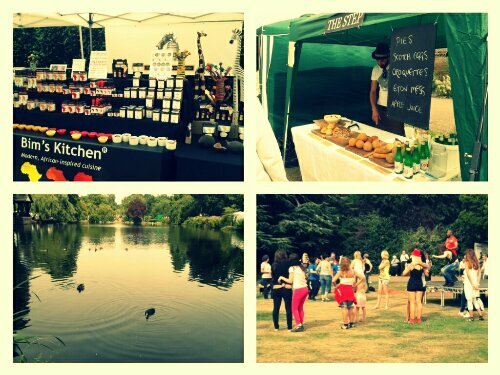 Held within the lush beauty of Broomfield Park in North London’s cultural and culinary capital, Palmers Green, this annual festival was the perfect Sunday escapade. The community event was a celebration of all the borough has to offer, from food and entertainment to shopping and education. It was difficult to resist the delicious international cuisine – delicacies hailed from a global trail spanning the Caribbean to Asia! Added to mouth-watering cakes from local tearooms such as Baskervilles, the sights and smells were beyond intoxicating. Arts and craft stalls offered everything from ceramics to jewellery and, if not content to buy, both parents and kids were encouraged to try their hand at making their own from porcelain, under the instruction of Doodle Designs. A children’s fun fair and separate activity and games stalls proved highly popular, while a local dance studio took eager volunteers through their paces, creating Palmers Green’s very own Strictly Come Dancing masterclass. The park’s pavilion area, hosted by Tropical FM, was used to introduce a range of performances from local school children. Singing and dancing with equal passion and nerves, the kids excelled themselves. The entire afternoon was an endearing hybrid of The X-Factor and Britain’s Got Talent – amazing! Festivals like this are what community is all about: congregating, celebrating and appreciating. Witnessing the multicultural residents of Palmers Green coming together to interweave their many cultures into a gigantic tapestry of fun and colour for all to enjoy was truly magical. Roll on next year so we can do it all again! Left thirsty and famished after attending the launch party for new Soho restaurant and bar, Coal Vaults, there was little choice but to seek sustenance elsewhere. 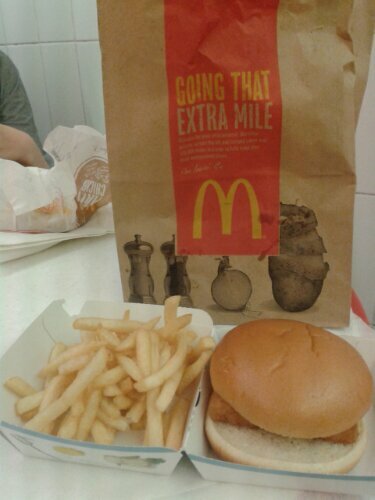 Luckily, McDonalds on Oxford Street was still open for business. Never before has a “Mickey-Ds” hit the spot to this extent. Delicious, filling and a huge relief. 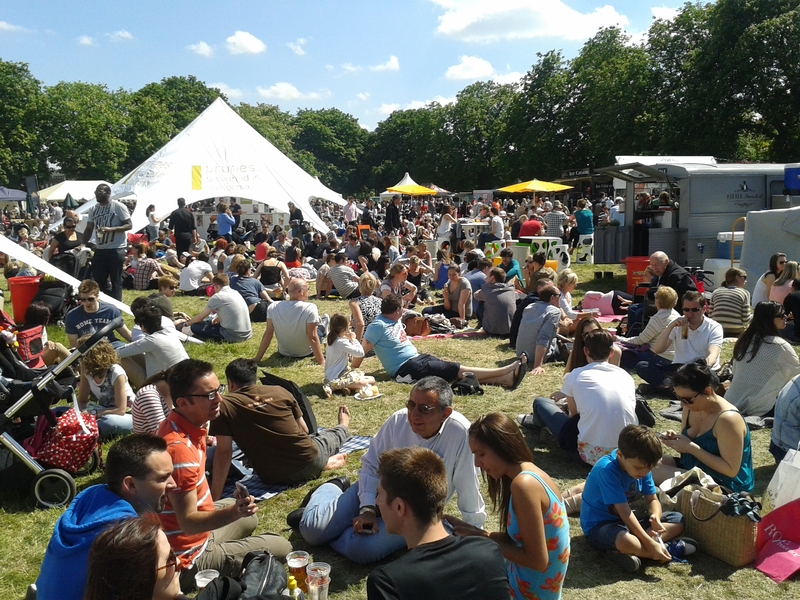 Hungry Londoners and discerning foodies from across the South East will converge on Clapham Common this weekend (June 7th, 8th & 9th) for a mouth-watering extravaganza, showcasing the best in street food, artisan bakers, pop up restaurants and international specialities. Aptly called ‘Foodies Festival’, this culinary celebration is the king of open air feasts, featuring live entertainment, celebrity-hosted workshops, exclusive masterclasses and even a mobile spa! I was lucky enough to win two tickets to attend the Hampton Court event during the final Bank Holiday weekend in May. It was the ultimate opportunity to spend a blissful Monday basking in the sun whilst eating good food, sipping on cocktails and humming happily to great music. The first thing to captivate me was the incredible aroma – simmering sauces and Asian spices competed with the unmistakeable smell of grilled sausages and barbecued meats. I marvelled at the discovery of exotic, new fruits, revelled in new flavour combinations (which I mentally noted to try at home) and sampled international street food that transported my imagination – and tastebuds – to faraway lands. Clusters of friends lounged on the grass, drinking Raspberry Mojitos, Bloody Marys (from Blood Shot bar) and refreshing Ginger Beer (the newly launched Grouse Ginger), as live singers belted out Beyonce and Stevie Wonder classics. Stumbling toddlers licked greedily at melting Purbeck Ice Cream while amused parents tucked into slow-cooked, pulled pork sandwiches (from Jamie’s Italian), Thai noodles (from The Noodle Bar) and generously filled Empanadas (by Chango). Strangers began talking to one another at stall fronts, sharing mutual appreciation for tasty, free samples. It was a visual and sensory feast laced with an atmosphere of discovery, excitement and deep contentment. The range of available food was genuinely spectacular – although I was slightly disappointed by the absence of any notable lamb dishes. Being of Greek origin, an abundance of marinated or spit-roasted lamb is as essential as water. That said, there were plenty of incredible alternatives, including hearty vegan and vegetarian options. Steak lovers made a bee-line for the Gaucho BBQ stand where the magnificent sight of huge hunks of meat, cooking to a slow char over hot coals, awaited. Burger fans headed towards the award-winning Street Kitchen for a cheese-topped ‘Buffalo Bill’ or a Crispy Chicken variation with Caesar Sauce. Of course, no outdoor food feast would be complete without the humble hog and foodies queued patiently for Roast Hog’s signature roll; ciabatta filled with succulent pork, homemade apple sauce and crackling. The Bath Pig delighted visitors with their quirky tapas ‘lollipop’; a skewer of creamy mozzarella and spicy chorizo balls – fun AND flavoursome! Not forgetting the British tradition of serving bangers, The Great British Sausage Co. had an array of different varieties to satisfy every appetite – all succulent, juicy and perfectly spiced. 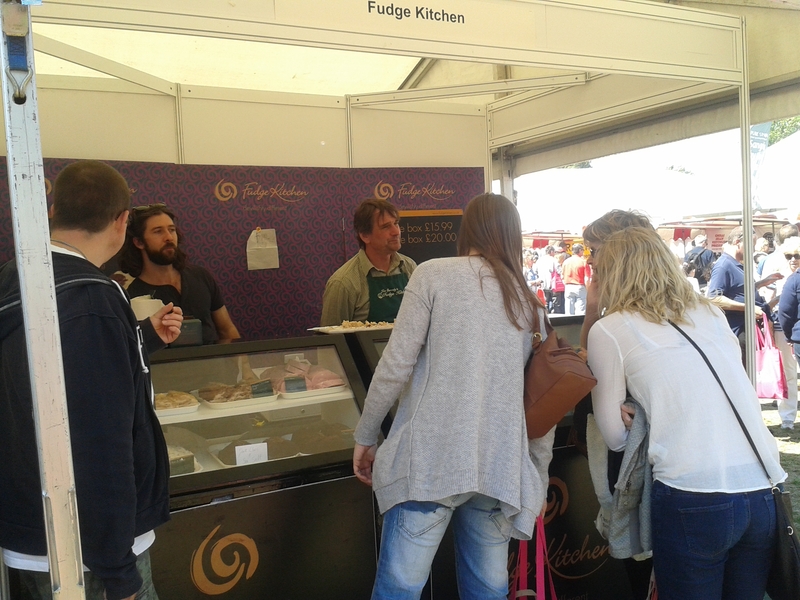 Sugar highs were available everywhere, with my favourites being Fudge Kitchen (I’m a long time fan! 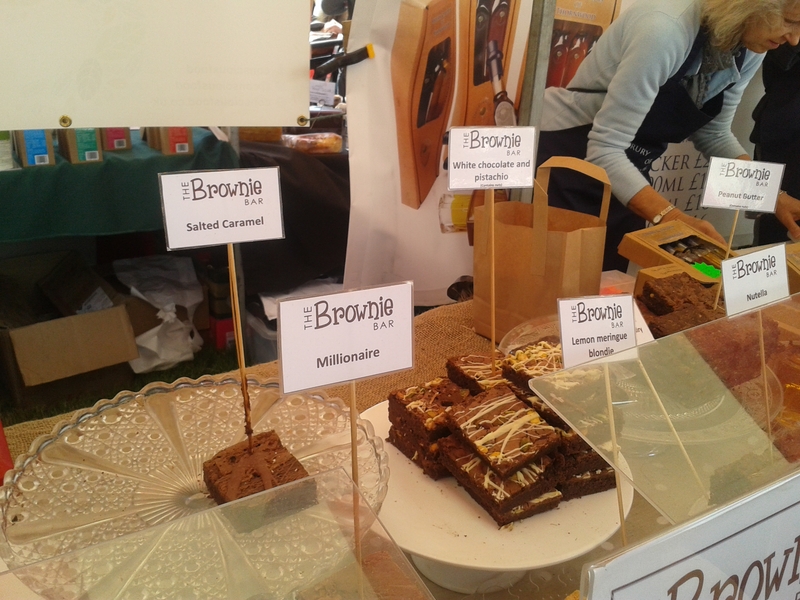 ), The Hummingbird Bakery’s vanilla cupcake (red velvet is so overrated) and The Brownie Bar’s signature creation (the clue is in the name!). 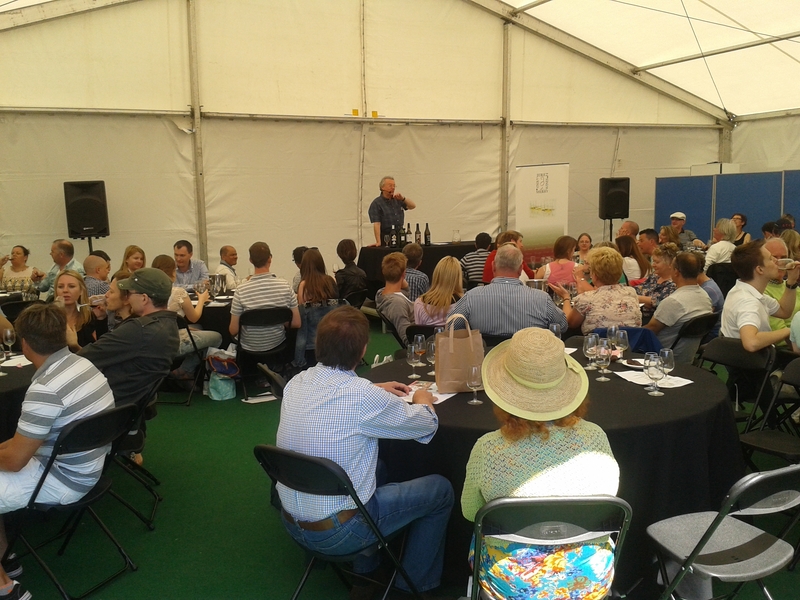 Demonstrations, lectures and workshops were provided for anyone looking to hone their cooking skills or food knowledge – including a Drinks Theatre, Cake & Bake Theatre, Chocolate Theatre and a very endearing Children’s Cookery Theatre. After forcing my way through an underwhelming Jerk Chicken Wrap from one of the Caribbean stall holders (freezing cold, despite just coming off the coals), I had set my tongue on fire enough to justify the need for an oversized ice-cream cone. Topped with gigantic, creamy scoops of raspberry ripple and rich chocolate, it was pure gluttony – my freebie intake at the Festival had already been epic! I managed to sample no less than caramel rum; flavoured vodkas; single malt whiskey; ginger beer; white wine; red wine; soft and hard cheeses; breads; crackers; olives; infused oils; bruschetta; fudge; chocolate; flavoured popcorn; tea; condiments; tapenades; organic honey; jams; sauces; cakes; macarons; vegan loaves; sausages; ham (you must try Jorge’s Deli); and barbecued meats. From an international perspective, my tastebuds toured across most of the United Kingdom, much of The Americas, through to the West Indies, on to Spain, Greece, France and Italy, some stop-overs in Eastern Europe and final pit-stops in Africa and Asia. It took Phileas Fogg 80 days but I safely travelled the globe in a single day. 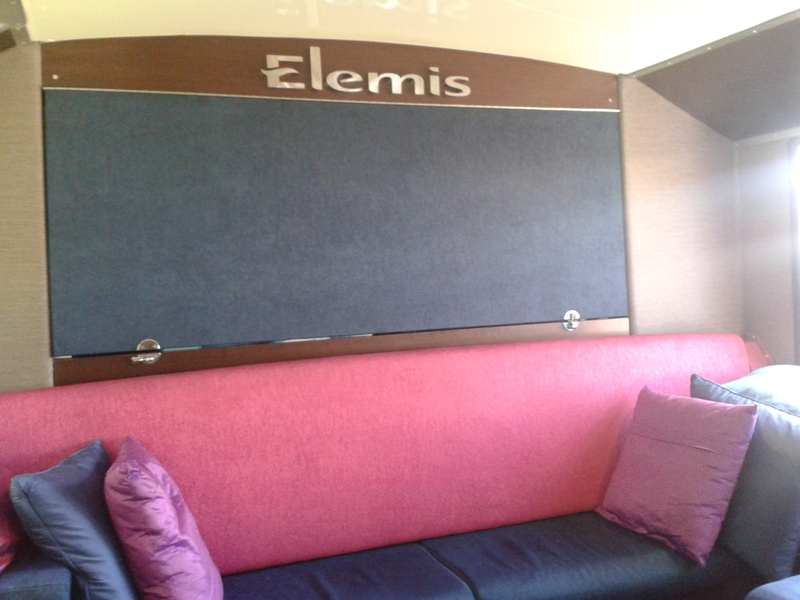 Weary from my travels, and with a satisfyingly full belly, I surrendered myself to the heavenly scented Spa Bus, courtesy of Elemis, for a glorious back massage (£15 for 15 minutes). Relaxed and happy, I finally headed home – armed with a sack of food and a freshly pressed lemonade, from The Fresh Lemonade Company, to hydrate me during the long train journey home. So good was my experience, I’ll be returning to Foodies Festival for the Clapham Common leg, because I’d be a fool to miss repeating such an enjoyable experience! Oxford South Parks (August 24, 25 & 26). 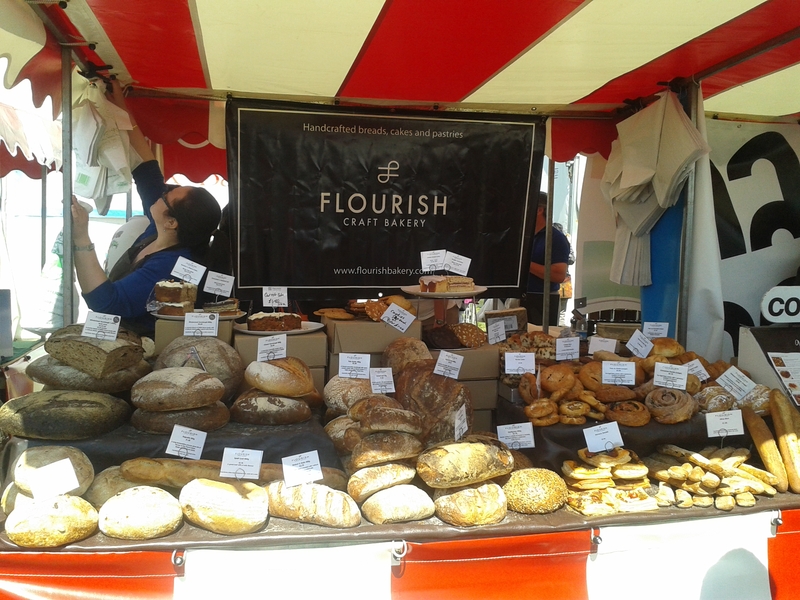 Tickets are available to purchase from the Foodies Festival website or, alternatively, can be bought on the day.